We have to encourage mutual respect among cultural communities. I didn't actually set out to learn about Chinese culture. I began by taking lessons to sharpen my pool and snooker playing skills from a volunteer instructor at the local community centre who happened to be Chinese. After six months of sending the snooker balls in the wrong direction, my instructor said, "Why don't you take up Mah Jong? I teach that too and I have an opening in the beginner class which begins on Thursday." 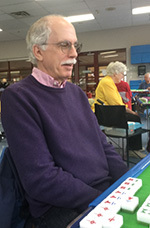 After the Mah Jong class ended, everyone continued on with a weekly Mah Jong game in the community centre which attracts many Chinese players and a diverse group of other enthusiasts from a variety of cultural backgrounds. It has turned out to be a very good way to have fun and incidentally learn something about other cultures along the way. According to the 2016 census, Chinese is now the most common ethnic origin in Richmond with 54% of the City's population, up from 34% in 1996. Canadian, English, Scottish and Irish ethnicity combined is 28%. Filipino is 8% and East Indian is 6%. The City of Richmond provides full details on its website here. Although a degree of cultural isolation and mistrust applies to all of the cultural communities, the size of the Chinese community makes it the principal target of mistrust. In addition, historic mistrust between First Nations communities and the non-native majority continues, fed by stereotypic characterizations and land claim disputes. The overheated Richmond housing market has put prices far above what most people who have been brought up in Richmond can afford to buy or rent. My ideas on what to do about it are here. A number of experts believe that non-resident wealthy investors play a major role in this market distortion because they are willing to pay much higher prices than local residents. See the commentary here. While there are a number of agencies in Richmond working effectively to integrate new immigrants, it is difficult to learn a new language and customs, especially for adults. It is much easier to interact with those who speak your native language and patronize stores and services geared to your native culture. When venturing outside that immediate environment, it is easy to inadvertently run afoul of local customs and cause offence. This can be interpreted as a lack of respect for the historically predominant local ethnic group, especially when that group is very sensitive about the fact that it is no longer predominant. Several Richmond groups sponsor intercultural activities such as a tour of various religious institutions. While these are well organized, they tend to attract the people who are least likely to exhibit ethnic prejudice. It is much easier to accuse an entire ethnic group of disrespect or ethnic prejudice than it is to accuse an individual that one has met. However promoting ethnic interaction isn't easy, especially when there is a language barrier. One way is to get the different ethnic groups working together on joint projects and events. This requires that those who can act as translators be identified and trained. Building something together that will endure as a community amenity not only gets people working together, but creates an enduring symbol of intercultural harmony. It could involve construction of a shelter in a park or the planting of flowerbeds. It is best promoted as a useful and fun activity. The fact that it is also designed to facilitate intercultural interaction should be de-emphasized. Each segment of the race has a different type of participant racing: adult, adult over 60 years, teenager, child under 10 years, pushed wheelchair, auto with 4 occupants, etc. Anyone can send in an application to participate, but they must specify an ethnic origin and languages spoken. Race organizers place the participants in multi-ethnic teams making sure that there are participants who can translate. Each team has a practice day supervised by a race organizer where they practice together and then have a group lunch. Race day is an event for everyone in the City similar to a July 1st parade. This idea obviously requires a lot of organization and a large number of volunteers. No doubt others can suggest equally effective activities that are less labour intensive. It's all about mutual respect. Respecting another culture doesn't require one to like that culture or even know very much about it. It requires a belief that members of that culture wish you well, do not intend to do you harm, and have a right to be different from you. Intercultural interaction can be promoted indirectly. People from different cultures are far more likely to interact effectively when they are engaged in an activity that interests them and does not have intercultural interaction as its primary purpose.